This fundraiser for the Walk to End Alzheimer's was held at the Warwick Valley Winery on Friday, July 20. It featured live music, a live and silent auction and award-winning wines. Click here for a video about the event. Rhythm & Vines is on Facebook; click here to view the page and follow it for the latest updates. The fourth annual Meeting of the Minds Dementia Conference was held 8 a.m. to 3 p.m. Thursday, May 17, at the DoubleTree by Hilton in Tarrytown. The full-day conference is dedicated to people diagnosed with Alzheimer's disease, family members, caregivers and professionals who provide support and services. Visit AlzDementiaConference.org or call 800.272.3900 for more information. ​﻿The Alzheimer's Association Walk to End Alzheimer’s® is the world’s largest event to raise awareness and funds for Alzheimer’s care, support and research. Held annually in more than 600 communities nationwide, this inspiring event calls on participants of all ages and abilities to reclaim the future for millions. Together, we can end Alzheimer’s disease, the nation’s sixth-leading cause of death. The Walk to End Alzheimer's Hudson Valley is on Facebook; click here to view the page and follow it for updates on the five Hudson Valley walks. I want to be part of a planning committee! On The Longest Day, teams around the world came together to celebrate the strength, passion and endurance of those facing Alzheimer's by doing something they love. Culminating on the summer solstice each year, this event calls on participants to raise funds and awareness to advance the efforts of the Alzheimer's Association all year. Longest Day Hudson Valley is on Facebook; click here to view the page and follow it for updates on The Longest Day. 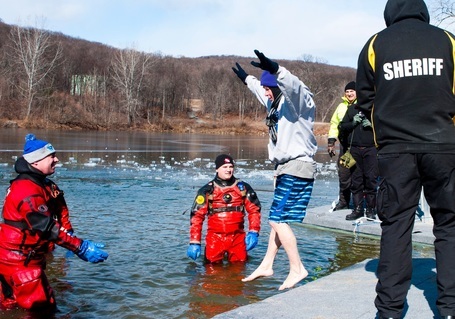 On Feb. 9, 2019, at Berean Lake in Highland, brave heroes will take a plunge into the water to fight Alzheimer's disease with the help of their sidekicks. Heroes wear colorful and creative costumes that help brighten the cold gray of winter in support of a great cause. Click here for a photo gallery from Subzero Heroes 2017 or click here for a video from the event. Subzero Heroes is on Facebook; click here to view the page and follow it to keep up with the latest on the event.